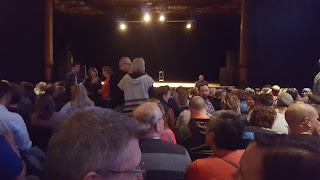 Last Saturday night I attended Rob Bell's "Holy Shift" presentation at Turner Hall in downtown Milwaukee. I'd never been to Turner Hall, a magnificent structure currently decked out in twenty first century-haunted house/money pit decor. Bell was accompanied by Peter Rollins another contemporary and perhaps equally controversial spiritual author/scholar. There are folks who have called Rob Bell some hateful things. His books have been pulled from conservative church bookstores. He was run out of his home church for some of his progressive ideas. I've read his book, Love Wins and while I'm not crazy about his writing style, I loved his message; a message of Love first, judgement maybe never. Furthermore, listening to his podcasts drove me a little crazy too. Something about his speech pattern. So, needless to say I had low expectations. I went in with a bit of a cynical attitude. Well, he came out and smashed any doubts I had about his style and message. He told engaging stories for an hour and a half without looking at a single note. His message was about the concept of holiness in the world both its bad manifestations (holier than thou) and its good, everyday manifestations. The message resonated with me for a number of reasons. As I have mentioned many times, watching my brother get sick and pass away changed my perspective on EVERYTHING. It also increased my sense of clarity about what is important and a recognition of things that are "holy" in life. These includes moments of conversation with a friend or loved one, natural settings that cause a sense of awe, and even a rock concert or author reading. All of these things can be holy events if you have a sense of connection with the rest of the world and its people around you. It was the best, most timely message I've had the privilege of being part of in quite some time. Time after time he had me nodding in agreement. He even brought to light the role our suffering in our anxiety and struggles in life, a theme I can definitely relate to at this point in my life. Lots going on in my life right now. But for a moment at least, Rob Bell helped me understand that it is part of our holy journey. It may not seem like it, but I think what he was saying was that when it passes, we are forever changed and perhaps brought to a better understanding of why it happened, or what role it played. But for me it was his story telling about moments of holiness that made me say "Yes! I've had that experience." Time after time he had me nodding in agreement. These events seem random and unscripted at times and maybe the difference is some people recognize them easier than others. Maybe it depends where you are on your journey to an awareness of God. Maybe it's just a case of being awakened by a tragic event. Or maybe its just an appreciation for all of life. I don't know. But I know I needed the good reminding I got by Bell on Saturday night.